One of the most significant decisions that managers make is who supports each individual; getting a good match can make a big difference to a person's life. When people are supported by staff who they like, trust and have shared interests and hobbies with, they are likely to be both happier and safer. The most dangerous place for people with learning disabilities to be is with staff who don’t know them and don’t care about them, with poor leadership. This results in awful situations like the one at Winterbourne View. 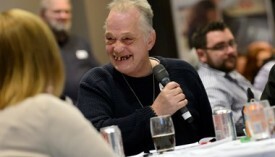 It is easy to think that involving people with learning disabilities in interviews is the way to address this, but it takes a lot more than that. We have a graphic that illustrates how the process could look. It has to start with the person’s one-page profile, which can be used to understand the support that they need, the skills that a staff member needs to have, the personality and characteristics that are important, and interests that it would be good to share. This then forms the basis of the person specification. From the person specification, the job description should be really clear about the overall purpose of the role (for example, supporting the person to be a contributing member of their community, to support them to lead and direct their own life), what their core responsibilities are and where they can use their judgment. Here are examples from Jennie’s life. It is important to look at the decisions that need to be made as part of the recruitment process, and think with the individual and the family if appropriate. A decision making agreement is a way to record how you are going to make decisions together. Rather than assuming what the person wants to, or should, get involved in, it is important to look at the whole process together, what decisions are made when and where, and how the person wants to be part of it (and which bits they want you to just get on with!). If you are not looking at recruiting new staff, but want to get a better match between an existing staff team and the people they support, then the matching support person-centred thinking tool can be very useful too. You can also match staff by using the person’s relationship circle, for them to choose who they want to support them, and then match to interests using staff one-page profiles as a way to inform this. Here is how Carolynn did this with Anne-Marie. You're here: Home • Health & Social Care • Learning disabilities and autism • How can we get (and keep) the right staff to support people?